An exciting and memorable road trip in New Zealand is a journey from Christchurch to Greymouth. A 241 km stretch traced along the State Highway 73 acquaints travelers with diverse landscapes and stunning views. The starting point of the Great Alpine Highway is the city of Christchurch. The largest city in South Island, Christchurch is a bustling cosmopolitan with the best of night life and entertainment. Punting down the Avon River, biking in the Port Hills and visiting the Sumner Beach are popular activities among travelers and locals alike. The next stop on this journey is Arthur’s Pass that is at a distance of about 150 kms from Christchurch. The Canterbury Plains, that fall enroute, are quite a sight to behold. Stretched across miles on end, the landscape is awe-inspiring and unparalleled. The Darfield Bakery or the Original Sheffield Pie Shop offer delectable local snacks that are a must-try on this trip. The drive eventually leads to the winding routes of the Southern Alps. Treat your eyes to an array of striking landscapes comprising hills, rivers, lakes, ski fields and a mountain pass. The Castle Hill, that is a little ahead, is well-known for a monolithic limestone formation. Besides being a great attraction for rock climbers, it offers panoramic views. Arthur’s Pass Village is a quaint little town nestled amidst alpine trees. A starting point for treks and trails through the Southern Alps, the hamlet plays host to tourists from all over the world. The last leg of this journey is a drive from Arthur’s Pass to Greymouth. Just about 5 kms from this village is the celebrated Otira viaduct lookout – an engineering marvel on the edge of the Western ranges. It is the main divide of the Southern Alps and offers views of the original road to the region that was in use up until 1999. The best part of the Otira lookout is the alpine parrot that is often also referred to as the ‘clown of the mountains.’ These species are rather intelligent and engage in antics that will leave you spellbound. As you descend the mountains, the landscape transforms itself dramatically and you will be greeted by verdant rain forests of the West Coast. Greymouth on the West Coast boasts inviting seascapes. Visiting a local brewery, a museum and going for adventures such as white water rafting and kayaking are all exciting activities one could consider indulging in. To the north of Greymouth, there lies an unspoiled coastline that comprises unique limestone formations called the Pancake Rocks. Much like everything else in the region, the sight is captivating. 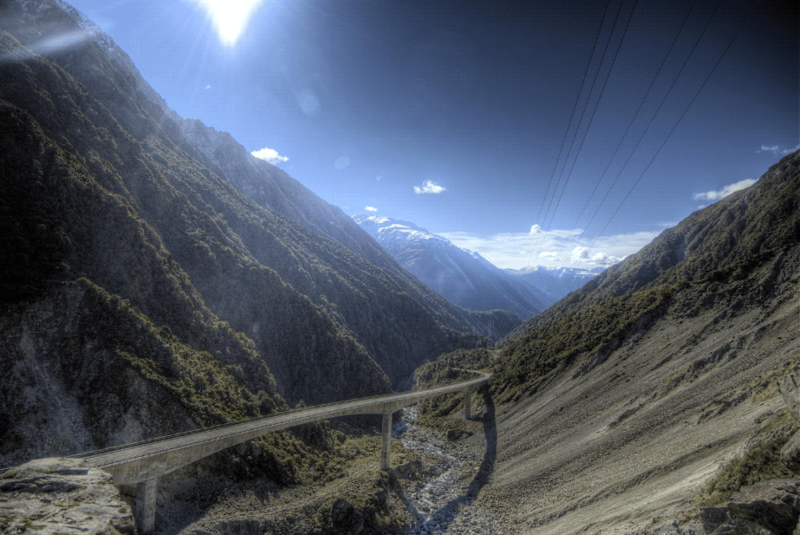 The Great Alpine Highway is one of the best ways to explore the diversity and encounter the hidden treasures of New Zealand. To enjoy this fun-packed road trip to the hilt, opting for car hire in Christchurch is highly recommended.